“picha” is a Japanese sound effect for “drip”. The more you know! ACT R GB1: [CB1] This turn, all units in the same column as this unit lose Resist, and cannot gain Resist. CONT: This card belongs to all nations and clans. Also 2 R&D clarifications – one obvious, and one less so! Q: Can rear-guards in the front row with Resist be chosen for an attack? Q: Can units with Resist be attacked with the use of skills that choose multiple attack targets, or skills that allow you to “choose a unit in the back row to battle”? A: Yes, you can. This is because such abilities are ones that “change the rules of choosing attack targets in the battle phase”. Today’s card is “Rain Elemental, Pichan”, a 《Cray Elemental》 with a special ability, that appears in “Absolute Judgment” (on sale August 26th, 2016)!! 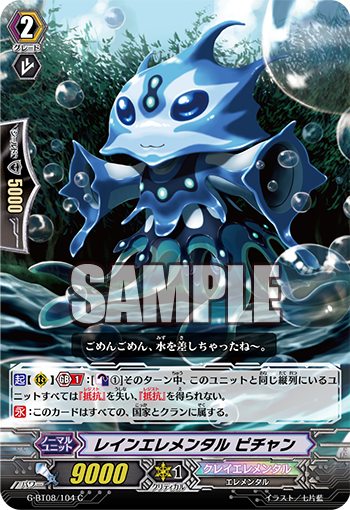 “Rain Elemental, Pichan” erases the 【Resist】 of all Units in the same column as this card!! It’s quite the lucky charm you can use in Decks like 《Link Joker》, which targets the opponent’s units with 【Lock】, or 《Kagero》 which has many simple Retire effects. Also it goes in Decks like 《Narukami》 and 《Megacolony》 which have many cards that specify specific cards. So you’ll be able to shatter your opponent’s 【Resist】 with just this card. Because this is an anti-metagame card, this is a card that’s hard to use in free fights. Since this is more of a card for experts, if you want to use it in your Deck, first evaluate what Clans are currently popular, and put this in your Deck if needed.